Meter A5 Laminating Pouches are the economical and safe way to laminate all of your A5 size documents. Manufactured from premium quality materials, our A5 Laminating Pouches are some of the best quality on the market and will work well in all Pouch Laminators – just make sure you order the correct thickness of pouch to suit your Laminating Machines. Also known as Laminating Sheets or Laminating Sleeves, A5 Laminating Pouches are usually 154mm x 216mm in size. This allows the pouches to seal around the edges of the A5 sheet being laminated, ensuring your documents are sealed and protected. All Meter A5 Laminating Pouches use high grade polyester and EVA glue in composition. Choosing the right A5 Laminating Pouches to suit your needs. The thickness of A5 Laminating Pouches is measured in microns. The micron measurement on all A5 Laminating Pouches is for each sheet – for example A5 80 micron Laminating Pouches have two sheets of 80 micron film joined on the short edge. The most popular is 80 microns, followed by 100 micron Laminating Pouches. These are for every day use in the workplace or for use in Schools. 125 micron and 150 micron A5 Laminating Pouches are used where the environments are more extreme and handling is intensive, such as Restaurant Menus and Teaching Aids. 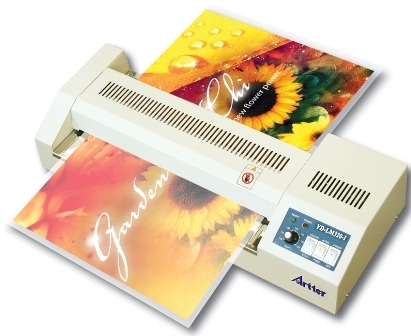 If you’re looking for choice in A5 Laminating Pouches you have come to the right place. 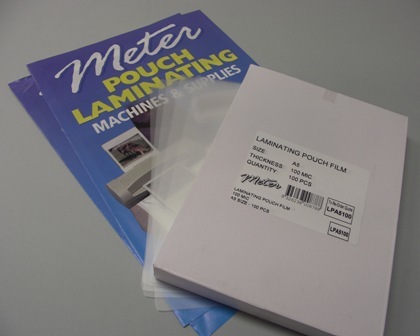 Meter Australia stock an extensive range of A5 Laminating Pouches in a range of different thicknesses and finishes. While the majority of A5 laminating pouches have a clear gloss finish, we also offer Matt Laminating Pouches in a frosted finish and A5 Sticky Back Laminating Pouches with a Self-Adhesive feature to create signs and window displays. Note: If you require a large quantity of A5 Laminating Pouches please contact us for a special price. Click on the links below for pricing and more information on each item in our A5 Laminating Pouches range.